We all love facts – especially historical ones and ones that are new to us. This list looks at 15 facts that are, hopefully, unknown to most of us here. From the Ancient world to the early modern times, these are all entries that have not appeared before on Listverse. Be sure to add your own unusual or little-known facts to the comments. 1. 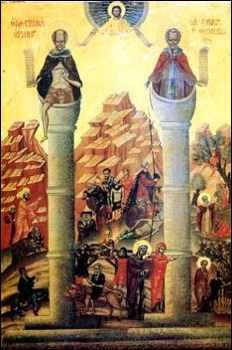 Saint Simeon Stylites (pictured) was a monk who gained fame in the 5th century for spending 37 years standing on a small platform on top of a tall pillar in Syria. He did it for ascetic reasons and his example was followed in later years by other well known stylite saints. His story is quite amazing and you can read more about it here. 2. In the First Dynasty of ancient Egypt, hoards of staff and family members were walled up with the body of the dead king. The humans and animals buried with the king were expected to help him in the afterlife. 3. In 1927 Otto Rohwedder invented sliced bread. He made the first machine to slice and wrap bread and won a patent for the process. After only six years from invention, more sliced bread was sold than unsliced. 4. In 1911, pigtails were banned in China because they were seen as a link with its feudal past. 5. To save the effort of sailing boats upstream, Mesopotamian traders built collapsable boats which they would sail downstream with a donkey on board. At the other end of their journey they would sell the frame and when they finished trading, they would use the donkey to return home. 6. In ancient Rome the punishment for killing one’s father was to be drowned in a sack along with a viper, a dog, and a rooster. The reason behind this? I have no idea. 7. 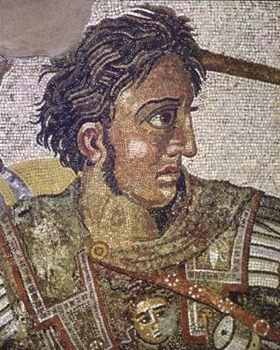 Alexander the Great (pictured) invented a spying technique still used today: he had his soldiers write letters home, which he then intercepted and read to discover who was against him. 8. In Gubbio, Northern Italy, a race has been run every year since the 12th century – and the outcome is rigged. Villagers carry three statues in the race, Saints Ubaldo (for whom the race was started), Anthony and George. Every year Saint Ubaldo comes first, Saint George second, and Saint Anthony last. 9. When anaesthetic was used for the first time in childbirth in 1847, the mother was so amazed and relieved at how painless the birth was that she named her child Anaesthesia. 10. The last time a cavalry charge was used in war was in the Second World War. A mongolian cavalry division charged against a German infantry division – the result? Not one German was killed and 2,000 of the cavalry were. 11. The grid layout used in many cities around the world is not a new invention – it first appeared in the city of Mohenjo Daro, in India, 4,500 years ago. The houses to the side of the streets had bare walls facing the street to keep out the sun and dust from carts. 12. 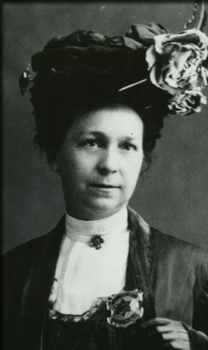 The first policewoman was Alice Stebbins Wells (pictured) who joined the LAPD in 1910. Because she was the first (and only) policewoman, she designed her own police uniform. Four years later, Britain had their first woman policeman. 13. In the 1700s in Paris, women wore hats with lightning rods attached when venturing outdoors during bad weather. Bad idea. 14. In circa 3100–3050 BC Egypt was ruled by its very first Pharaoh – King Menes. It was said that he was the first human ruler – inheriting the throne from the god Horus. 15. Gorgias of Epirus (3rd century BC), a Greek sophist, was born in his dead mother’s coffin! Pallbearers heard him crying out as they carried his mother’s coffin to the grave.